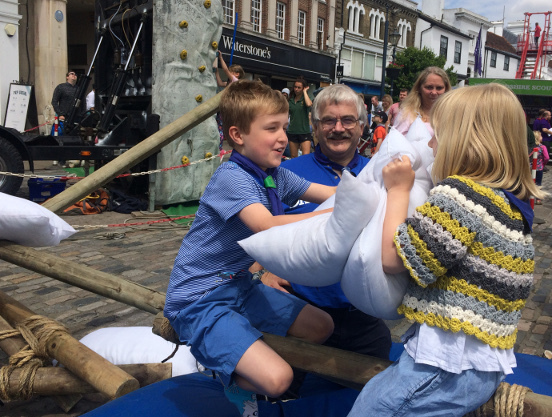 We joined the District’s ScoutItOut display in the Market Place: a zip wire, climbing, archery, caving (in the CaveBus), sumo wrestling and more, finishing up with a camp fire on the cobbles. Using the pioneering practice from Thursday, the Scouts helped to build a pillow-fighting apparatus for Beavers and Cubs. This entry was posted in Beavers, Cubs, Scouts by David Rossall. Bookmark the permalink.